Usually on Wed morning I am at CBJ morning prayers. Today I am with fellow congregants having a spectacular day in Israel. We started our day heading toward the border of Syria. During the 1967 War we were able to push Syria back and gained 15 miles. We were impressed with how close we were to the Syrian border. We were told about the Golan Heights. There is wine country and free range cattle and wheat. There are also minefields. In the area there are 18,000 Druze and 25,000 Jews. There are 22 to 23 jewish communities. We also observed the Army presence. As we were driving we could see Mt. Hermon and the snow caps. 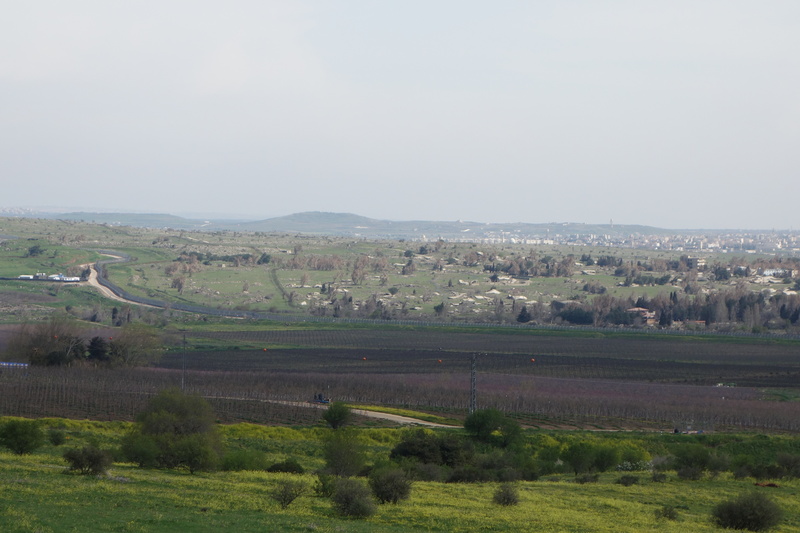 As we were driving we could also see the Hula valley and the Lebanon border. David and Maddy joined us on this Tour. They are here in Israel til some time this summer. Then we toured the Tel Dan Reserve. Seeing the rushing waters, the birds and the trees and the fauna were magnificent. follow someone else. They believed that worship could be done anywhere not just in Jerusalem. We looked at the Gates and the elders that may have sat inside the Gates doing business and maybe even deciding Punishments. We had lunch in Kiryat Shemona. As we continued we got close to the border of Lebanon. Then we entered the Army base that patrols the border with Lebanon. We met with a number of Druze soldiers and also with a representative of Kibutz Misgav-am. The fellow from the kibbutz was Betzalel. He told us of his background. He also introduced us to the soldiers. We as a group had prepared gifts of food, chocolates, candies and even gear from the S.F. Giants. We spent some time talking to the soldiers. It can be very exciting and also lonely for the young soldiers who constantly have to be on the alert. Although the area seemed quiet we were told some of their outfit had participated in a skirmish not long ago. The soldiers thanked us for the visit and told us it had brightened an otherwise tough day. We learned about their lives and how often they get to go home. We continued to drive to Tiberias. We said goodby to Jon and Reva. They were going home a day early. Some of us walked around Tiberias and then we all had dinner together. Tomorrow is our last day for this CBJ trip to Israel.